I started my first side-hustle in the third grade when I traded a beanie baby for a fat stack of Pokemon cards with an upperclassman. It was a pretty sweet set up: I’d pitch hopeful bidders against each other for the holographic cards and rake in the sodas and sweet cakes every lunch hour. Unfortunately, my ability to market was limited by my curfew, and it wasn’t long until I watched my not-hard-earned goods exchange hands at twice the price I’d charged. Thankfully, the state of the side-hustle has improved since those early days, and now more than ever, creators can reach wider audiences and build stronger customer bases on their own terms. In fact, 40% of the 2,000 entrepreneurs in our community are juggling their side-hustles -- selling online courses, freelancing, and running membership sites -- on top of a regular day job. But that’s about to change. 73% of those side-hustlers are planning to take their business to the big leagues and turn it into a full-fledged revenue machine and career. So if you’re on edge and still debating getting in on the side-hustle, let’s lay those worries to rest today: the side-hustle economy has never looked better. Here’s what you need to know about the side-hustle and how to get into one. Put simply, a side-hustle is any business venture that brings in income without constituting a full-time job. The income and hours may be comparable to a full-time arrangement, but because it’s a side-hustle, regularity isn’t guaranteed. It sounds a little convoluted, I know. The problem with making sweeping generalizations about what a side hustle is and what it isn’t is that, to date, no single authoritative source agrees on how to measure the gig economy. Depending on who you ask, side-hustlers make up anywhere from 4% to 40% of the US workforce. For the sake of clarity in this article, we’ll be defining side-hustlers as those who cultivate revenue streams by selling services or products on a freelance basis. But no matter what they do, their income is created on their own terms -- they’re their own bosses, even if they’re working for clients directly on a one-on-one basis. Sounds good, right? That’s not the best part of being a side-hustler, though. The best part of a side-hustle is that, typically, they aren’t resource-intensive. Side-hustles don’t require significant investments to get rolling, nor do they mandate spending 40 hours a week before you see returns. Granted, the more resources you can put into the side-hustle, the faster it’s going to get off the ground, but it isn’t uncommon to hear stories about side-hustlers investing pocket change and pulling in rent within a few weeks of work. For instance, consider the case of the IT professional, Terri Morris, who suddenly found herself out of a job when a company buy-out turned into a department closure. 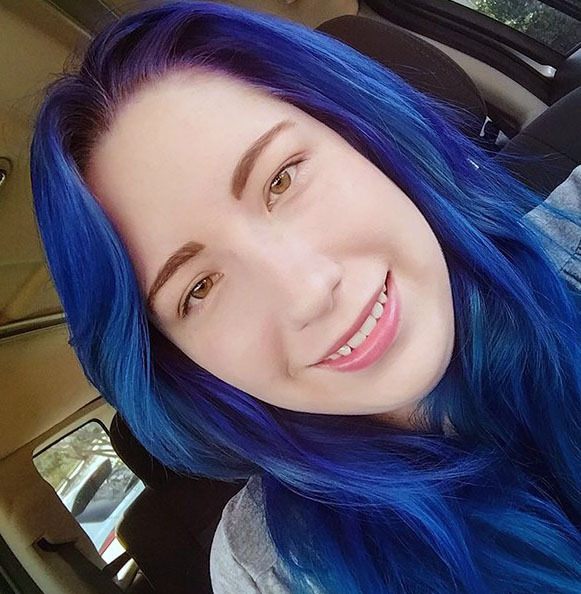 Within five months of creating a side-business and getting into digital products, she pulled in $2,653 in recurring monthly revenue. That’s a bankable salary within the same time it takes for a new episode of Sherlock to circulate. Still, even if you’re not interested in making your side-hustle into a new career like Terri, the dividends for picking up gigs on the side are significant. People who add a dash of moonlighting on top of their primary career usually make 19% of their income from their extracurricular business, and on average add $7,600 to their annual funds. That’s the lower end of estimates for side-hustlers, by the way. 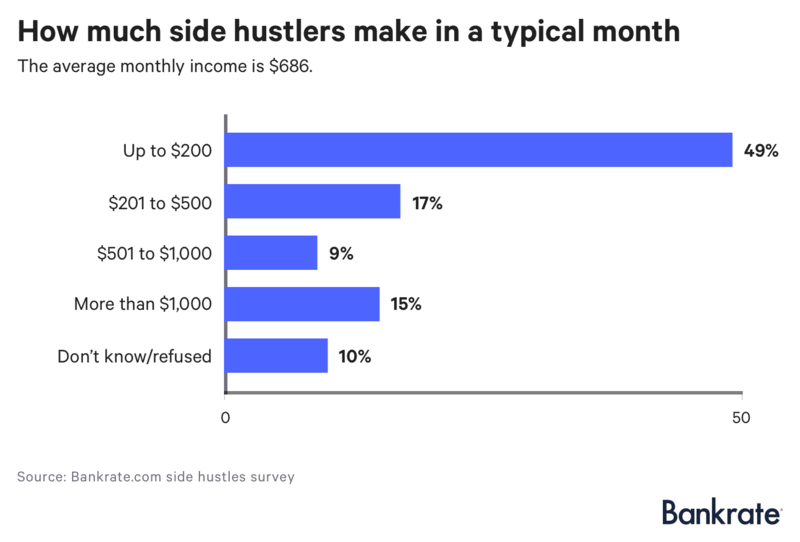 In a survey of over 1,000 side-hustlers, the average monthly income reported was $686 for a few hours of work, which comes out to $8,232 a year. So what is a side-hustle? A flexible way to make money that has the potential to become a full-time hustle if you want it to. If you don’t, it’s enough to pad your pockets with disposable income so you can finally take that trip to Prague and add guacamole to your Chipotle order fearlessly. Take your time nurturing your side-hustle. Becoming your own boss may sound like the perfect excuse to drop your current career, but if you can, it’s better to explore the challenges of the side-hustle with the protection of stable income. Find what you can uniquely contribute for customers. You have something that no one else can deliver to your audience (no, really, you do -- don’t listen to impostor syndrome), and they’re willing to pay for it. Don’t fixate on your first idea. What your customers want and what you deliver may not be aligned the first time, but that’s okay as long as you’re heeding the first piece of advice. Build your marketing and products one step at a time. Getting lost in the weeds and trying to juggle every aspect of a business is easy, and unfortunately, detrimental. Try to become a master of one rather than a jack of all trades. Now, if that all sounds good to you, let’s talk about some profitable side-hustles you can start today. 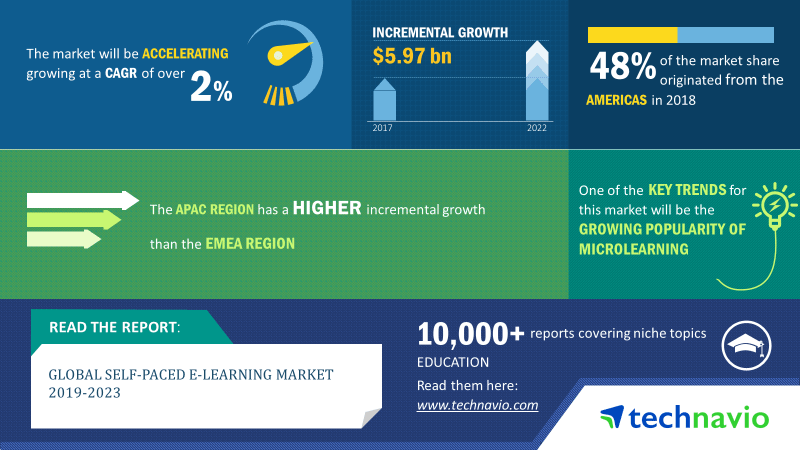 By 2022, the self-paced e-learning market is expected to grow by nearly 6 billion USD with a compound annual growth rate of over 2%. All of which is a very arithmetic-heavy way of saying that there’s a lot of money in online education, and that money isn’t going anywhere anytime soon. But let’s zoom in a little more: what does that mean for your side-hustle? It means if you want to get into a one-time-creation product that delivers continuous income over time, you want in on online courses. We analyzed over 132,000 online course sales and found that the average price for a single course is $182.59. So if you were aiming to hit the average monthly income for a side-hustle -- $686 -- you’d need to sell four courses a month. And the more courses you add to your offerings, the more sales you can make. That’s what professional educator turned online entrepreneur, Reuven Lerner, discovered when he was setting up his courses. “I found that having more courses not only meant that people were buying more because I had more to offer, but I think they took me more seriously,” he told us, which is why he offers multiple types of products at different price points as you see below. And yes, because you’re probably wondering by now, it really is easy to create an online course -- you can shoot professional-quality videos on an iPhone and start pre-selling your online course before you’ve put the finishing touches on your first lesson. In fact, we highly recommend doing it in that order. Pre-launching your online course helps you suss out the market need and build hype around your product before you’ve put in the work on a deliverable that your audience may not resonate with. And that, in turn, helps you sidestep the top-two widowmakers for new businesses -- lacking a market need and running out of cash -- by keeping your dollars and time invested in a path you can guarantee will lead to a profitable launch. But since I’m not in the habit of lying to you, I have to clarify that online courses are not completely passive income. Nothing is, actually. The idea of creating a product once and then kicking your feet up on a beach for the rest of your life may be a romantic (and appealing) fantasy, but it’s just that -- a fantasy. Online courses only sell as well and often as they’re marketed to the people who need them, which is why it’s so important to nail your online course marketing strategies down early. It’s even better if you put those strategies in writing, too. Marketers who document their process are 466% more likely to report success than those who don’t. Still, if you’re looking for a side-hustle that doesn’t require a lot of maintenance -- after you’ve created it, you just need to work on marketing it -- online courses are an excellent solution that can cost you as little as $330 for the first year. If you’re seeking something a little more intensive, however, you may want to consider this next side-hustle instead (or on top) of online courses. 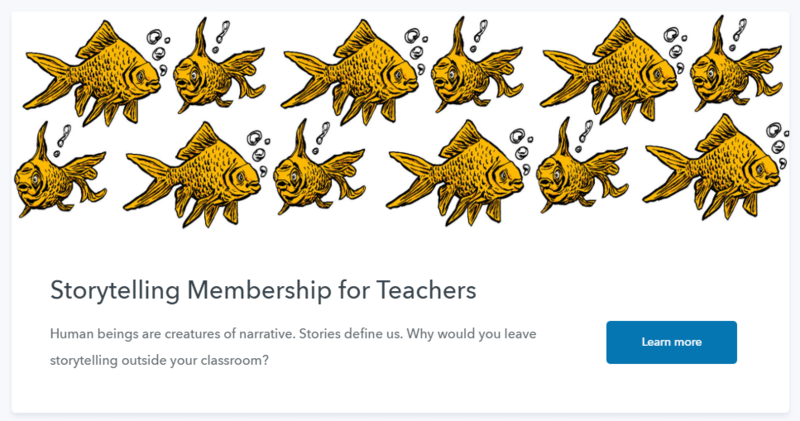 Online courses have a lot of benefits, but they lack one critical aspect that membership sites deliver better than any other kind of side-hustle: recurring revenue. Because while an online course will only sell once to one customer, income from a membership website refreshes itself every term. Membership websites are part of the subscription economy, and it’s an economy that’s booming faster than ever. 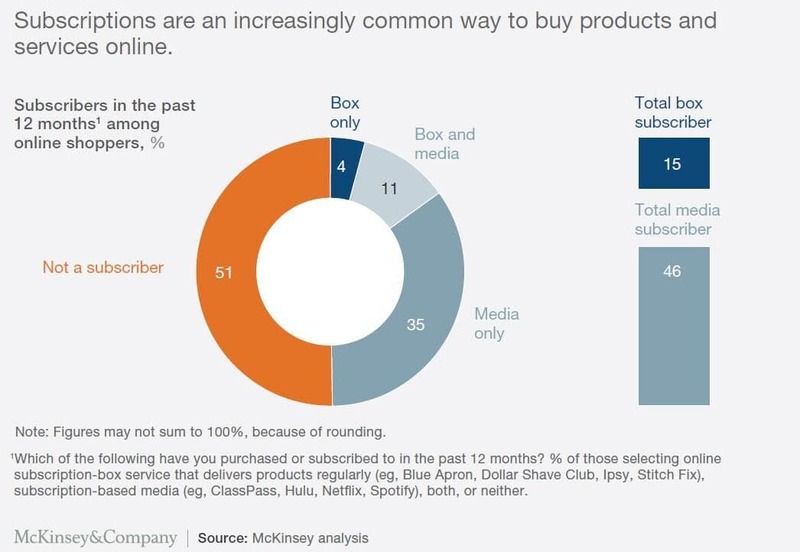 15% of online shoppers have started a paid subscription in the past year, and of those, half have signed up for a media-based -- i.e., digital product based -- subscription. That said, membership websites come in many varieties, and some models lend themselves to side-hustles better than others. Product bundles. By far the easiest type of membership site to run as a side-hustle, product bundles are what they sound like -- customers pay a monthly or yearly stipend to access your other digital products. Think of it as Netflix for digital products. Updated content. If you’ve built an audience with blogging, you can convert that audience into paying customers with this type of membership by releasing exclusive content to them for a fee. Community-based. At this point, commitment factors ramp up, but community-based memberships are still viable as a side-hustle as long as you can devote a few hours every week to interacting and engaging with your customers. Coaching-based. Prefer to work with customers one-on-one? If so, a coaching-based membership site may be the perfect way to expand your budget without dissolving your free time. Content caches. This type of membership is best reserved for veteran creators who have the time and resources to build a cache for their customers, but while it has the heaviest initial commitment, it’s relatively low maintenance afterward. Still, none of this addresses the meat of membership websites: sure, they can give you recurring revenue, but how much? Enough that you can set your own schedule and make it a full-time income like Jamie Keddie did with his storytelling membership. Better yet, skip the supposition and take a look at exactly how much you can make with a membership site side-hustle by giving our membership profits calculator a spin. Then, turn your attention to our final side-hustle of the day, because we’ve saved the easiest for last. If you’re pressed for time or want to start off as risk-free as possible, you want to start off with this next type of side-hustle. Justin Jackson, who made over $100,000 on Podia, started his career as a solopreneur with one sample of a not-yet-completed ebook. He didn’t anticipate his side-hustle becoming an empowering and fulfilling business when he created his first landing page. “I thought, ‘Okay, well, I'm working full time as a product manager, but I'll just put up a landing page.’ …. 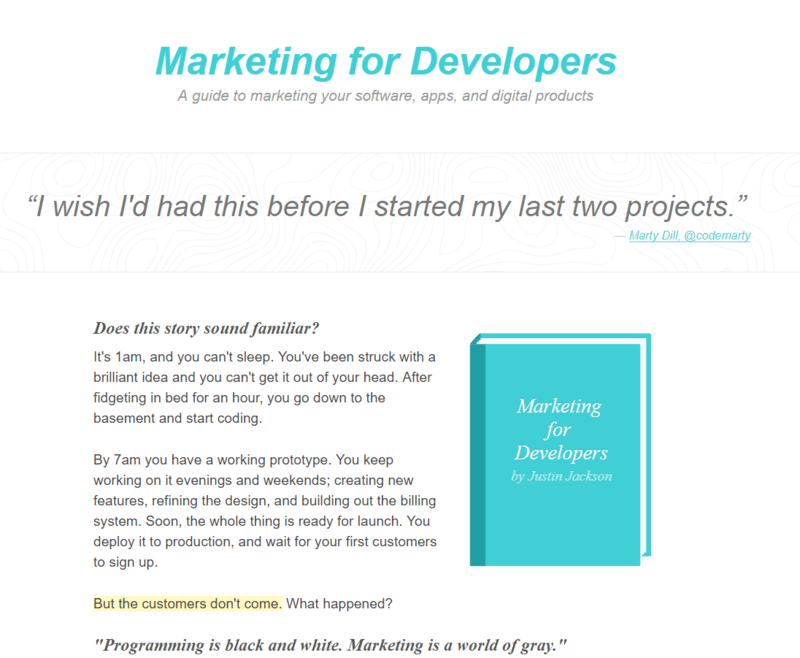 all I'd written was the sample chapter,” he reminisced of Marketing for Developers, pictured below in its original 2015 incarnation. That single sample chapter led to a business that raked in $146,000 the first year he took it from side-hustle to full-time. He’s not the only one who’s seen amazing returns from selling digital downloads, either. In fact, ebooks out-sold print and audio books by a significant majority in 2017. Granted, ebooks accounted for less total retail dollars, but when you consider how cheap they are to produce -- they can be created with the same free tools you’d use for online courses -- their profit margins are very attractive for the side-hustler. Digital downloads aren’t limited to just ebooks, by the way. They can take many forms, including downloadable workbooks, fonts, photographs, music, and printable planners like what you see below on Chantel Arnett’s storefront. Likewise, a digital download can be assets for other creators like Mackenzie Child’s Blocks Wireframing Kit for Sketch. Basically, if you’ve got the creative spark to make something and it can be put into a file format, you can sell it as a digital download either by putting it on your own website or through an online marketplace. As long as your sales page is outfitted with the right trust-boosting elements and you’re putting in the work to get that download in front of more people, it’s a simple way to dip your toes into an online business without sacrificing more than a few hours of your week. One that, as Justin proved, can do more than just change your monthly balance -- it can forge entire careers. A side-hustle that makes you a few extra bucks at the end of the year is a great way to offset living costs, but the best kind of side-hustle does more than just pad your pocketbook -- it creates opportunities for the future to be your own boss. A side-hustle is anything that brings you income without becoming a full-time job. You may earn the same as you would at a full-time job, but you’re not beholden to anyone else’s terms but your own. 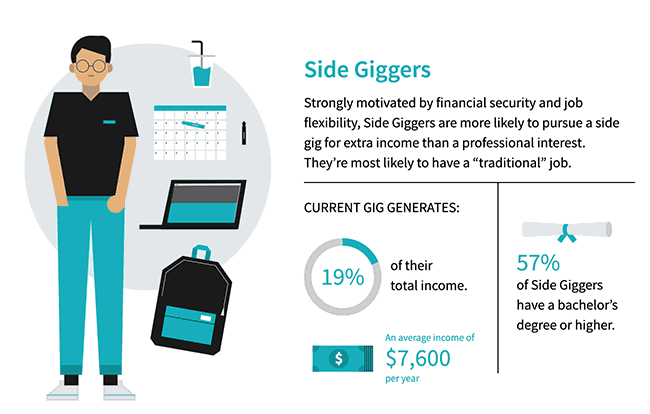 Side-hustlers comprise as much as 40% of the workforce and are expected to continue growing in the future. Finding a side-hustle that works for you isn’t an instantaneous process, and even if you intend to make it a full-time career, it’s best to start off small and build your way up. When you are ready to start, however, online courses are a profitable and low-maintenance side-hustle you can create easily in your downtime. 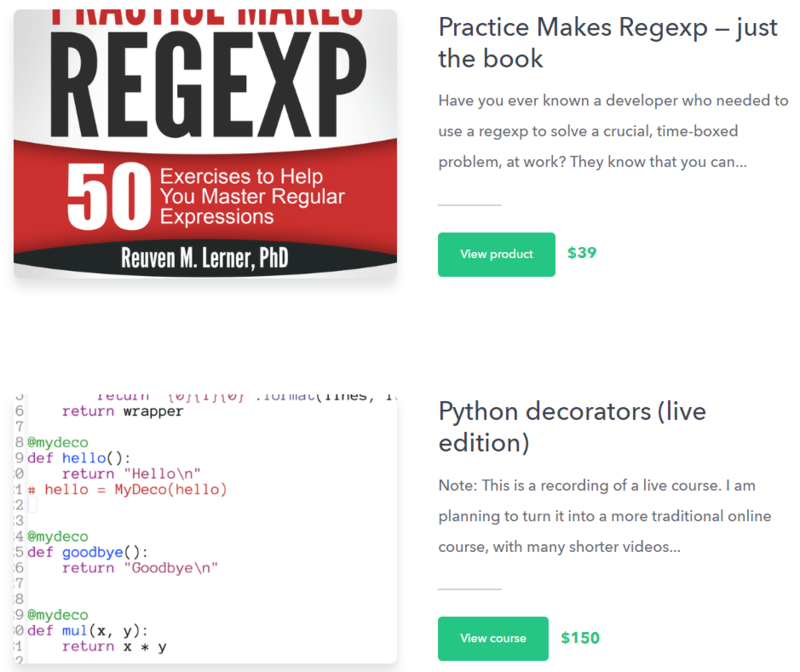 Want to ramp up more than online courses and get in on recurring revenue? Then a membership website is just the ticket you need for a side-hustle, though these take more time and investment than online courses. That said, if you’re looking for really low maintenance profits, you can’t beat selling digital downloads like ebooks, workbooks, and creative assets. Basically, whether you’re looking to make a little extra cash on the side or want to build your own business from the ground up, there’s a side-hustle waiting for you. And when you’re ready to sell digital downloads, memberships, or online courses, we’ll be waiting with a free two-week trial to help you get started, too.